5 The Most Undervalued Supplement For Mass Gain? Despite its poor image, fat has value in any diet, whether it is a diet to gain weight or lose weight. The low-fat diet craze (thankfully, that’s ended, hasn’t it?) 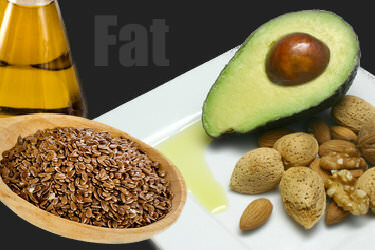 has left a lot of people with an incorrect view of dietary fats and their capabilities to promote good health. If you take a step back, clean the slate and take a fair look at fat you’ll find an impressive food to gain weight. Combining with glucose, fat becomes the major energy source for our bodies. Fat is highly concentrated. It provides 9 calories per gram, more than twice the amount provided by protein and carbohydrates. To gain weight fast, fat should comprise 20-30 percent of your diet. Don’t forget fat. Without it, you’re not likely to gain the weight you want. But the idea is not to just shove a bunch of fat down your gullet without regards to type. Go easy on the saturated fats. They are not good for your heart. To avoid them completely would be difficult and isn’t necessarily wise (they have muscle building benefits as well). A good plan is to keep your saturated fat intake at or below 10% of your total caloric intake. There are three major categories of fats: saturated, polyunsaturated and mono-unsaturated. Polyunsaturated fats are known as your Essential Fatty Acids (EFAs) or as Vitamin F. Polyunsaturated fats come from corn oils, sunflower oils, flaxseed oils and certain fish oils among other sources. They are called essential because your body cannot manufacture them. Unlike saturated fats, polyunsaturated fats can actually have a positive impact on your blood cholesterol levels. They can raise your HDL level (the “good cholesterol”) and lower your LDL level. The two primary types of EFAs are the omega-3 (alpha-linoleic acid) and the omega-6 (linoleic acid). Most important to weight lifters are the omega-3’s due to their roles in tissue-building. Mono-unsaturated fats come from vegetable and nut oils. They are also good for you, showing a positive impact on LDL levels and importance to keeping your body functioning at the highest level possible. EFAs play critical roles in building muscle. They are the starting point for the body’s manufacturing of other fatty acids that the body needs to support lean muscle growth. Perhaps most important from a bodybuilder’s point of view, EFAs keep the hormone-producing glands active. This will help maximize the production of many hormones including our favorite – testosterone. But the benefits of EFAs don’t stop there. Within EFAs, vitamins are transmitted (so fat helps vitamins reach muscles) and stored. In the liver, fat helps with the digestion of protein and decreases insulin sensitivity. With this help, your body will be able to use more protein to build muscle and absorb carbohydrates more slowly (decreasing their chance to turn into body-fat). Additionally, EFAs provide a great source of energy that doesn’t readily convert to body fat, they help the brain function at a high level (at least, at the highest level you’re capable of), keep joints strong, lubricated and injury-free, and decrease inflammation in muscles which leads to shorter recovery periods. Great fat sources are certain types of nuts, avocados and cold-pressed oils. I’m not a fan of nuts nor avocados (and you’d have to be a big fan to get your doses everyday from these sources), so my preference is for the cold pressed oils. For most people trying to gain weight fast (or just looking to better their health for that matter), supplementation is necessary to get the ideal amounts of EFAs. Flaxseed oils (EFA Oil Blends) are excellent sources. They can be put into weight gain shakes, salads or soups and don’t taste too bad when used this way (downing them straight is another story). Softgel tablets are another way to get some EFAs into you if you just can’t stand the taste of the oils. They are much more expensive and don’t provide you with anywhere near the amounts of EFAs (and therefore the benefits) as the cold-pressed oils though. But they are probably better than nothing. Only go this “pill-popping” route if you absolutely can’t find a way to get the cold-pressed oils down (put them in a weight gain shake and you should barely be able to tell they are there). The Most Undervalued Supplement For Mass Gain? Without a doubt, the title is earned by the EFA oils. Don’t be surprised if you find yourself experiencing a lot of non-muscle building related benefits while supplementing with EFA oils. Noticeable skin, hair and general energy improvements are common. This is a powerful supplement, not just for muscle building but for general health. It doesn’t get the play it deserves simply because the heavy-hype muscle nutrition companies haven’t got in on the game (for a variety of reasons). Rest assured, though, it is a staple supplement for experienced and knowledgeable trainers. Another valuable supplement that is often mistakenly left off the lists of beginner bodybuilders because it isn’t heavily hyped is your basic multi-vitamin. Learn more about the vitamins and minerals you need to make sure you are providing your body.